Right now, the internet is chock-full of news stories about the start of squirrel hunting season, with plenty of outdoor writers either waxing nostalgic about hunting for squirrels as children, or lamenting the decline of the popularity of squirrel hunting. And, there’s also no shortage of news stories on deadly squirrel hunting accidents, like this man who died while hunting in California or this teen in Kentucky. But few of the stories I have read give you any information on what you should do with the squirrel once you’ve killed it and cleaned it. • Four squirrels, skinned and cut up. • One cup of creamed corn. • Three pounds of peeled and diced new potatoes. Sorry for the alarmingly graphic photo. 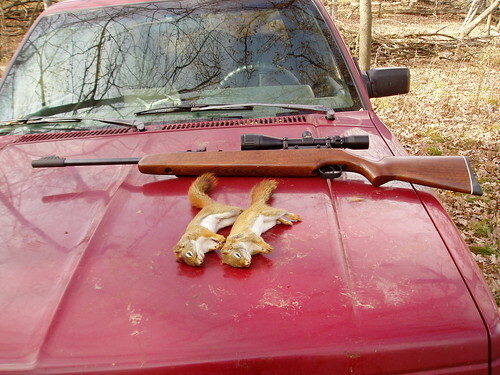 Most “squirrel hunting” photos on Flickr show the smug hunter, holding up his kill — always by the tail – for the camera. This one, at least, looks a little less ridiculous. Growing up in South Texas, I’m used to hunting — of deer, quail, javelina (hog) and dove. But squirrels? No. So perhaps that’s why it strikes me as an absurd source of prey for hunting. Squirrels are tiny. And so easy to bait with some peanuts or other tasty morsel. I guess I don’t get it: Where’s the thrill in shooting a squirrel? Desperate times call for desperate measures, so I understand how, traditionally, squirrel meat is a better option than no meat. And, given my Texas background, I also see the benefit of population control via hunting. But I can’t support the hunting of red squirrels — the species in the photo above — because they are in decline everywhere. If you’d like to read more about squirrel hunting, this article from the Lafayette, Louisiana Daily Advertiser makes for fascinating reading. Like this gem from Wildlife and Fisheries commissioner Henry Mouton.